Oooh I bought my first book on Kindle for my iPhone and feel like a traitor to the printed word, I am trying to console myself with thoughts of trees saved but still feel a little mucky. Well actually I read the first one already and downloaded the rest of the series. (ha) Once again I have to say that I am not a 14 year old masquerading as 40, it's just that I do love anything and everything fantasy related no matter the designated age profile. Plus Swan isn't old enough yet to be embarrassed by me reading the same books as her. 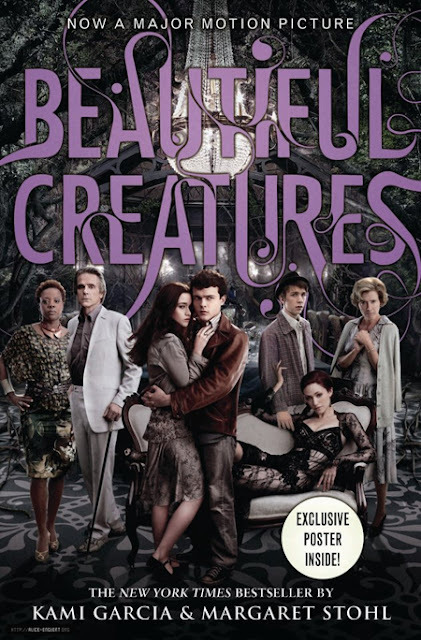 BEAUTIFUL CREATURES is like TWILIGHT but with the protagonists swopped around, Lena the bewitching Caster (very much the role played by Edward) and Ethan (boy Bella) have a star crossed or should I say moon shadowed love. Can't wait to see the movie, I am dying to see the costumes, Deep South sets and special effects.